So this is a blog I’ve been meaning to write for about a week now. 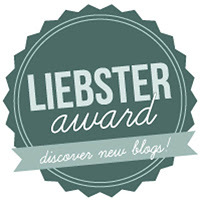 My dear Twitting bud and fellow blogger Julia nominated this here corner of the internet for a Liebster Award! So we can now sort of say that my here blog is award winning. Quite lovely that, so thank you Julia! 1: Why have you picked up blogging? I’ve had blogs I’ve run before, so it’s not strictly new to me, but this is the first one I’ve run where it’s entirely my own space, and where I can express myself and showcase my writing, which is why it appeals to me most I guess. 2: What do you love most about the internet? Oh loads of things. I love connecting with new people who share your interests and passions. I love discovering new things, new ways of communicating with people and groups and associations. 3: What do you hate most about the internet? Trolls. People who create viruses. The Daily Mail website. In that order. 4: What do you like most about yourself? I like that I’m always quite honest about myself. I’m three years off turning 30 now, and am slowly coming to accept the quirky habits I have which I’ll never lose that I spent most of my late teens worrying over trying to lose. 5: If you could change one thing about yourself, what would it be? Probably the way I talk. I hate the sound of my own voice back. I know that no one does but I sound like David Beckham crossed with Yoda, and no one wants to sound like that! 6: What does your perfect day look like? Right. I’ll close my eyes and picture this first…OK! Sunny day, round my sister’s, with my mum and dad, and all the family, playing with my little nieces and nephews, and eating a roast. 7: Which place on earth would you love to go to one day? Ireland – and as a matter of fact, I’m going there in July, to Cork! After that I’d say Venice and also Barcelona. 8: What’s your favourite food? 9: If you had to pick one song to describe your life, which one would it be? Simon & Garfunkel, ‘The 59th Street Bridge Song (Feelin’ Groovy)‘. Because whatever the day, I always try to feel groovy. 10: If you could live in a book, film or TV show, what would it be? Man, so many to choose! I’d probably say ‘Friends’ for this one. I’ve always wanted one of Joey and Chandler’s lazy boy chairs! 11: If you could go back in time, what year would you travel to and why? I’d go back to the early 1960s so I could visit Hitsville U.S.A in Detroit and see all those fabulous Motown songs being recorded by Stevie Wonder, Jackson 5 and Marvin Gaye. 1. I was born on a Saturday. 2. I am the youngest in a family of five. 3. I love VW Camper vans. 4. My favourite shops are Paperchase (stationers who do AMAZING notebooks) and Lakeland Homewares. 5. My favourite colours are sky blue and yellow. 6. The last album I downloaded was the Spice Girls’ greatest hits! 7. I make an excellent cup of tea. 8. My karaoke song is Justin Timberlake – ‘Like I Love You’. 9. The last book I read was Dawn French – ‘A Tiny Bit Marvellous’. 10. Since last year, I write a twice weekly column for the music website Buzzjack reviewing every UK top 40 hit by girl groups since the year 2000. This was so much fun, thanks again Julia for nominating me, don’t forget to check her blog out here – for my nominees, the rules are below and for everyone else reading this, I hope you enjoyed it! 2. Display the award on your blog — by including it in your post and/or displaying it using a “widget” or a “gadget”. (Note that the best way to do this is to save the image to your own computer and then upload it to your blog post). 1. Put your iTunes, Spotify or music listening device of choice on shuffle, and write down the first ten songs that come up! 3. You’re holding a dinner party, and can invite five people of your choosing, dead or alive. Who do you pick? 9. What motto do you live by? 10. Last person you called? 11. Draw a picture of yourself and paste it here.